Are you sick of playing the same old chords on your acoustic guitar? Open chords and bar chords while useful, will only get you so far. With soloing being such a focus for many, it is very common for guitarists to be well advanced in this area, yet display at best, an intermediate level of chord knowledge and playing. Today, I am going to show you some advanced sounding chords for your acoustic guitar that are really quite easy to play. 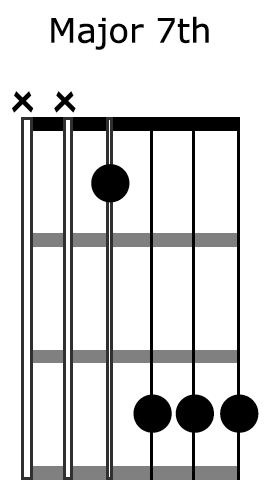 This type of chord can be played in several positions on the guitar, covering the entire range of the fretboard and can be used in both rhythm and soloing contexts. Not only this, but it’s also extremely easy to change between major, minor and dominant chords, the three main chord types you will come across in music. So, what are these chords? Well, they tend to go by several different names, but I like to call them block chords. Another name I’ve heard is 4, 3, 2, 1 voicing’s, as these chords fall on the top four strings of your guitar. 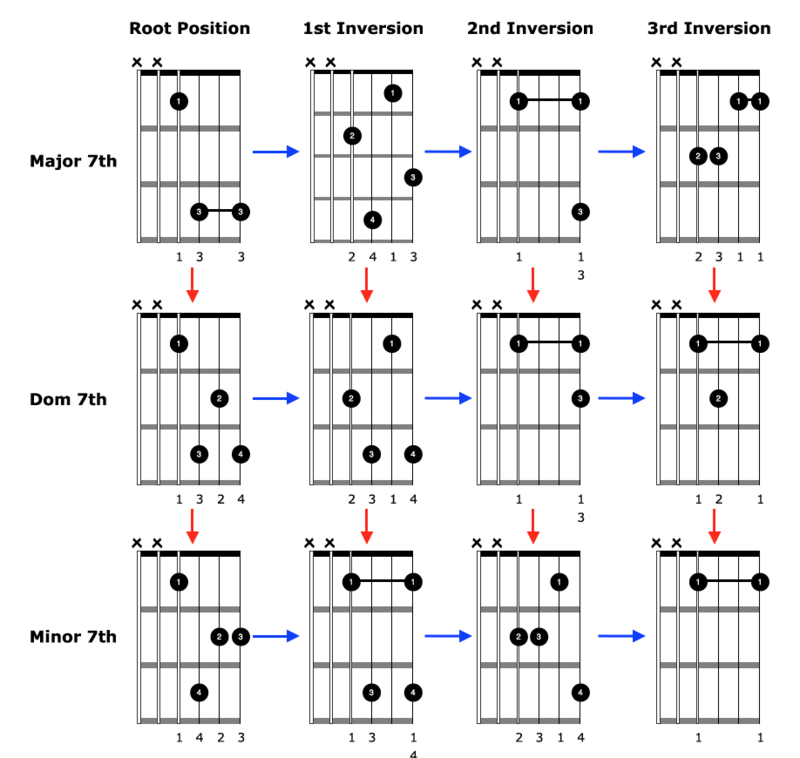 Whatever you want to call them, these chords are extremely useful for your guitar playing. They sound really advanced, are easy to play, and will have you creating all sorts of awesome sounding music up and down the fretboard of your guitar. Todays article will focus on the visualisation and application of these chords on your guitar without going into any theory. That’s for another article. You don’t need to know the theory behind these chords to be able to use them in your guitar playing. Don’t Leave It As Long As I Did. Focus On And Develop Your Chord Playing! The subheading says it all really. For too long, with my own guitar playing, I had a great in-balance between my soloing skills and chord skills. No prizes for guessing which out weighed the other. I could solo and improvise on a high level, yet really only knew my open and bar chords. Sure, there were some chords outside of these types I would play, however I had no clue how they worked outside of the songs I played them in, so they were useless to me and certainly not what I considered to be part of my own guitar playing. Then along came block chords. I was introduced to these when I first began studying jazz and haven’t looked back since. What’s interesting is that while I learned these chords in a jazz context, I found them to be extremely useful in other styles of music too, and use them regularly to this day. Block chords have a way of opening up the entire fretboard to you, and are very compatible for your acoustic guitar playing. There is a key relationship, or perhaps we could call it a way of going about learning block chords that will make them so much easier for you to access and remember. Chords must be easy to access on your guitar or they will be useless to you. This is why it’s never a good idea to buy one of those chord encyclopaedia’s to go through it page by page trying to memorise all the chords. These books are a great reference, however the key to learning chords on your guitar is in how they relate to each other on the fretboard. Now, if we want to make this a dominant 7th chord we only need to alter one note. This is because there is only one note difference between a major 7th and dominant 7th chord. If you are not familiar with chord formula’s and the notes that make up a particular type of chord, not to worry. It is beyond the scope of this article to go into chord theory, however just accept for now that it’s very easy to create a dominant 7th chord from our major 7th form by altering just one note. Notice all we had to do was move the note on the 2nd string of the major 7th chord down one fret. Further to this, it’s easy to create a minor 7th chord from the dominant form, again by altering just one note. Notice all we had to do was move the note on the 1st string of the dominant 7th chord down one fret. This is how to learn and visualise your block chords on the guitar. It’s all about how they relate to each other. Now I did say that these block chords will open up the entire fretboard to you. This is because we can play not just the root position forms, but the inversions of these chords as well. Again, I don’t want to get into the theory of chords, formula’s, inversions etc, that’s for another article, I just want you to focus on the visualisation and application of these chords for now. 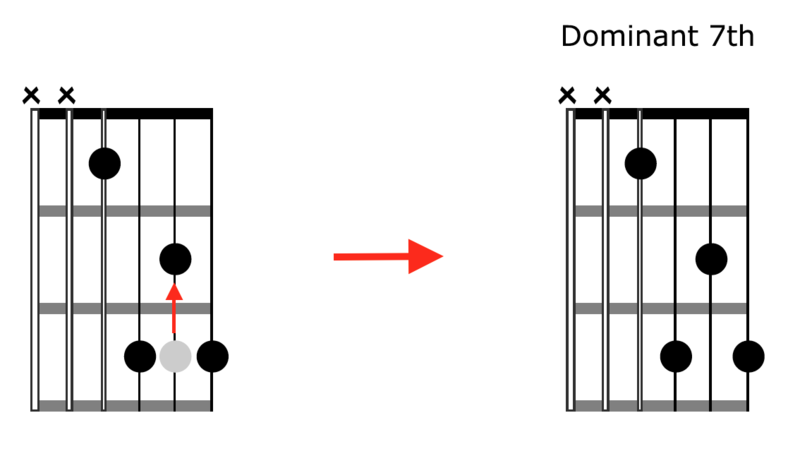 You don’t need to understand the theory behind block chords to be able to use them in your guitar playing, and that is the focus of this article. 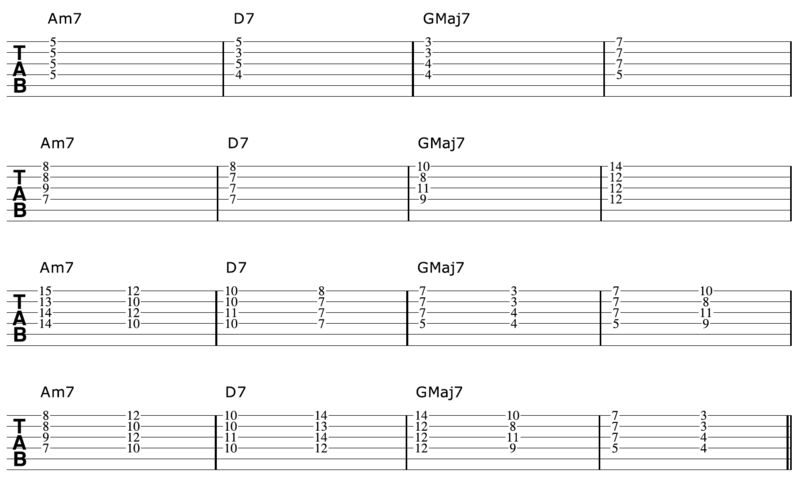 These four block chord shapes run right up the fretboard. After the 3rd inversion you would be back at the root position shape again, only this time it would be an octave higher on the guitar. In each shape I have highlighted the root note. Knowing where the root note is in relation to the shape of a chord helps one find the particular chord they are after. Notice there is only ever one note difference between each chord shape when following the red arrows. Now you have a bunch of block chords running up and down the neck of your acoustic guitar, what do you do with them? You have four positions for each of the three main chord types you will come across in music; major, minor, and dominant. This being the case, you can use these chords in most situations, and because they are targeting the top 4 strings of your guitar, they are great for soloing with too, but that’s another article for another day. A great progression to begin with is what’s known as a II V I. This progression pulls the II V and I chords out of the key giving you one of each chord type, major, minor, and dominant. In the above example I have used a variety of block chord forms over the progression. 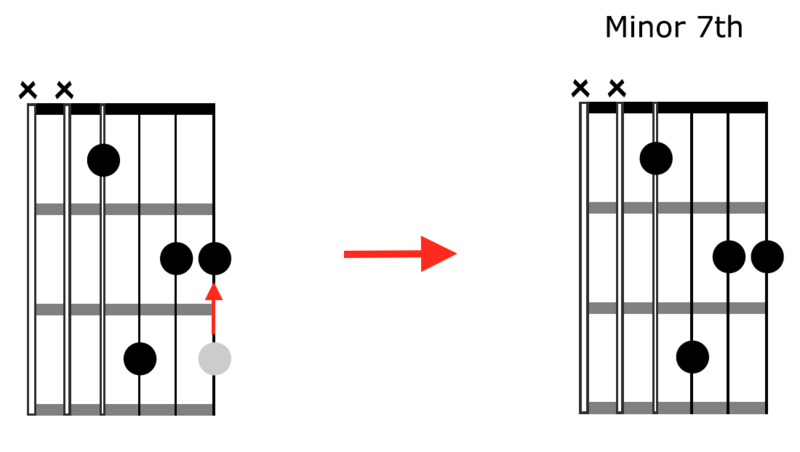 I have purposely kept more or less to the same area of the guitar for each rotation of the progression so that you can see how each chord relates, and that there are indeed common notes shared between each shape. For the last two rotations of the progression, I am moving between different block chord forms over the static chord. This sounds great moving between different forms when the progression itself has not changed chord. Here you get a glimpse into just what’s possible with block chords in your acoustic guitar playing.